failsafe. Please test in the GroundControlStation if the AutoQuad detects a lost signal when the radio is shut down. Power off the transmitter, power off the receiver. Now ONLY power on the receiver (red light will blink), push the receiver bind button ONCE. Power off the receiver. Failsafe is now disabled. 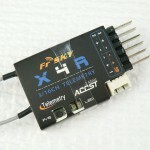 At this time all FrSky X-series S.Bus receivers are known to work with AQ (X8R, X6R, X4R). A great option is the small but full-featured FrSky X4R (pictured at left). 16 channels, full-range, replaceable antennas, with great telemetry options. It can even be easily modified so that an S.Bus inverter is not required. See here for details. Don’t forget to disable failsafe, as described above. 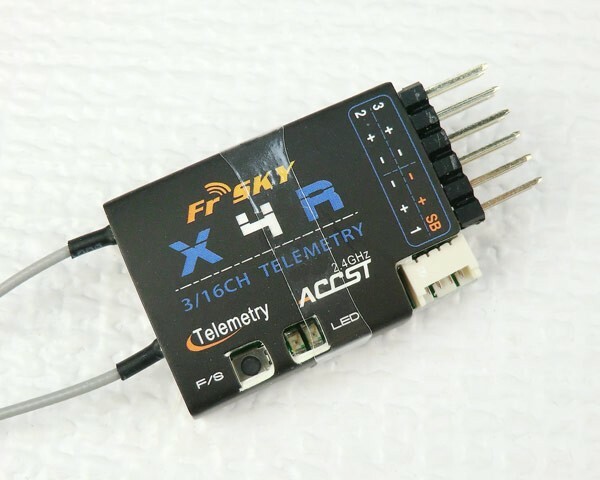 UPDATE: In late 2012, FrSky released an updated firmware version for D8R/D4R-II receivers which extends the PPM pulse length to 27ms. This solves the problem described below. Anyone using a compatible FrSky Rx with AQ is encouraged to update their Rx firmware ASAP. Warning about FrSky CPPM (original 18ms version): A FrSky PPM frame is 18ms long. A standard channel moves from 1 – 2ms. When using 8 channels to the max it will come to 8 x 2 = 16ms, the (needed) PPM sync puls is then only 2ms. That can either be considered as a valid channel (very wrong) or at least it will not recognize it as a sync puls and discard it.This obviously can create a dangerous situation that AutoQuad (or any other flight controller) can’t solve. Either only use 7 channels with (FrSky) PPM, or limit the switch output channels to 60-70%. AutoQuad will still be able to use that output but the maximum PPM frame will be less occupied. In normal circumstances this will probably never cause issues, but beware that FrSky is aware of this error but has yet not released a solution. More on this topic on this forum. Setup files for FrSky Taranis. This page was created on 17-Oct-14 by MaxP. Last modified on 2-Nov-15 by kinderkram.